Upon arrival at the theater, follow a host to your seat, and settle in for the 90-minute performance of Devdan – Treasure of the Archipelago, a performance that will have you swept up in a magical tour of Indonesia that includes both traditional and contemporary music and dance. The Devdan story begins when two young children, who are part of a tour group in Bali, feel bored and climb toward a cliff. They find a treasure chest containing various items that will bring them, and the audience, on a spectacular journey through this country of islands. 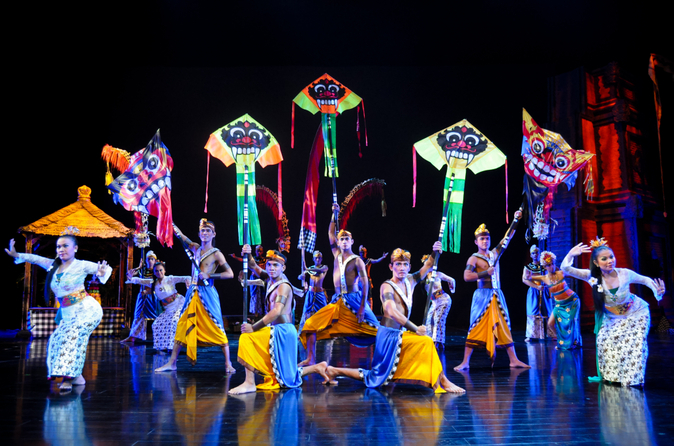 A unique cultural experience, the show is a theatrical tribute to Indonesia, intended to aid in the preservation of its diverse traditions and entertain audiences of all ages from around the world. This energetic visual tour of the Indonesian archipelago — from Bali to Sumatra, Java, Borneo and Papua — offers a fusion of aerial acrobatics, astounding costumes and high-tech special effects. Conde Nast Traveller listed Devdan – Treasure of the Archipelago in '10 Things to Do with Kids in Bali,' so don't hesitate to bring your kids; the dynamic show invites everyone to participate and dance along with the performers. Please note: A minimum of of two people per booking is required.